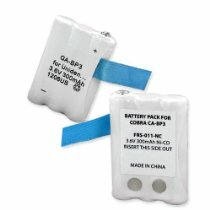 The FRS-011-NC is a 3.6 volt 300mAh rechargeable Ni-Cd battery pack for COBRA PR145, PR150, PR155 radios. Re-charges in original Cobra chargers. Replaces original Cobra battery # GA-BP3.